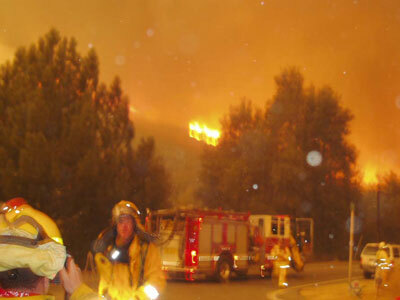 At approximately 7:00 p.m., on the evening of October 27, 2003, the Novato Fire District receives notification from Woodacre Emergency Communications Center (Marin County) that it is to send a Type III engine to Southern California to assist with the current wildland fires. A four-person crew consisting of Captain McDonald, Engineer Kreps, Engineer Rucker and Firefighter-Paramedic Smith are assigned to staff engine 6162 from an established rotational list. During the intervening period prior to actual dispatch at 9:27 p.m., the crew begins to collect the items they will need for an extended assignment. The crew has just returned to shift, at 8:00 a.m., that morning, from a four-day break. None of the crew has worked any extra shifts during the preceding few days. That day, Novato fire crews have had a light to moderate call volume by recount of the on-duty battalion chief. None of the members have any significant record of sickness or injury from the previous weeks. According to the strike team’s ICS 214 form and the statements of Firefighter-Paramedic Smith and Engineer Kreps, the task force makes several pauses for fuel and rest stops along the drive to the Cedar Fire incident base (fuel is received at Santa Nella, Interstate 5/Highway 41, Pasadena). The crew of engine 6162 rotates drivers approximately every 100 miles between Engineer Kreps, Engineer Rucker and Firefighter-Paramedic Smith. XAL 2005A arrives at Gillespie Field incident base at 11:00 a.m. on October 28. After check-in with the Resource Unit they are directed to the Incident Base for food and rest. During this period, Engine 71 (Camp Parks) is added to the task force to give them a total of five engines. XAL is now designated as a strike team with a strike team leader and assistant leader. At 1:15 p.m., on October 28, 2003, Strike Team XAL 2005A is sent to the area of the intersection of Interstate 8 and Highway 79. Near that location they undertake a structure protection assignment on Riverview Road (“Camp Oliver”) where they support a burnout operation. They are told to hold in the area until 9:30 p.m. that evening to patrol for hot spots. during the first night of activity. A Fire Weather Watch was issued at 9:30 a.m. on October 29 by the San Diego office of the National Weather Service for increasing gusty southwest to west winds of 15-10 miles per hour in the mountains with locally higher gusts. The winds were to have increased further during the night time hours and into Thursday with gusts of 45 to 50 miles per hour with humidity’s below 15 percent. Later in the afternoon of October 29 (after the accident) the Fire Weather Watch was upgraded to a Red Flag Warning. RAWS data from the Julian Station at the approximate time of the accident indicates average 20foot winds of 17 miles per hour with a peak gust of 31 miles per hour out of 252 degrees, with a temperature reading of 74°F and 34% relative humidity. Review of all Training Records and past incident assignments where available, indicate that nearly all personnel had received the appropriate position and ancillary training necessary for their particular assignments on the fire. All operations or line personnel involved with the fatality incident have had both positional training and functional experience. No training gaps were found. There are a few exceptions for Incident Command Team (ICT) personnel, but those lacking positional training have had previous functional experience. The notable exception was ICT Safety Officer John Simon. Safety Officer Simon has not had the 400 level Safety Officer training required for major command team assignments, only the 200 level (S-204) class. Simon has had Safety Officer experience on a number of assignments. All personnel on Engine 6162 had appropriate positional job training. Experience records provided were in the form of dispatch records, which list the personnel, dates, times and the general type of response. Experience records received show the majority of wildland calls had been for grass or light vegetation, although the run-cards do not contain sufficient information to support this conclusion. All of the Engine 6162 crew have had training in wildland urban interface firefighting and fire behavior. All line personnel including the Strike Team Leader for XAL-2005A, the Division Group Supervisor, and Branch Directors have had the correct positional training including intermediate fire behavior.